KoopaTV: BREAKING NEWS: MOTHER 3 Virtual Console Release Imminent! December 21, 2011 registration? That's so... overdue. But, finally, some justice. It was sort-of just Mother's Day... over in the United Kingdom. I'm sure it was a coincidence, since Nintendo has proven several times that they don't care about anniversaries or special occasions when it comes to the MOTHER series. This just finalises the lasting farewell for the Wii U's Virtual Console. You can't get much better than this. I hope you still have enough money saved up in your Nintendo eShop balance. If you don't, then, hey, the KoopaTV Loyalty Rewards Program can hook you up with a sweet $10 Nintendo eShop code by the end of this new month. We'll be announcing mid-round standings for Round 13 on Monday April 3, but let me tell you: They're standing, yeah, but on real shaky ground. Anyone (even whoever YOU are) can still come in and win! Lucas can now finally take his adventure outside of Japan. Ludwig would like to apologise for this article technically publishing on a Saturday rather than a Friday, but processing breaking news takes time and had to go to the next calendar day. It's still enough articles in a week, but it means April has one more article and March has one less article than originally planned. 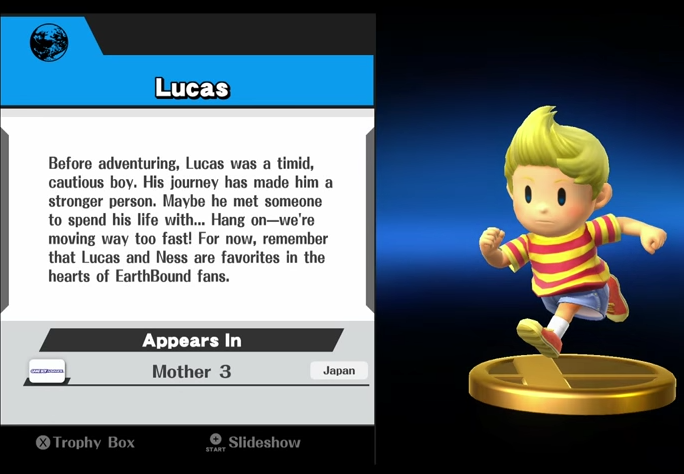 Once you've forgiven Ludwig, he hopes that you will be enjoying MOTHER 3! All of the protests outside of the Nintendo of America office must've actually had an effect. This is a much higher quality article than the one when EarthBound was released on the Wii U Virtual Console. I have forgiven you, Ludwig. However, how can we play Mother 3 if we can't play a Virtual Console?! Why wouldn't you be able to play on the Virtual Console? You followed my eShop on a Budget article, didn't you?! The Nintendo Switch doesn't have a Virtual Console. Yes... I still have money on my account, too. Oh. I thought it was NeoGeo under the Affordable Care Act. As April Fools Day jokes go...this is one of the best I've ever seen. Unfortunately, that was also its downfall. It was too GOOD a joke to fool me. I don't know what you're talking about on multiple levels. Really? Even though you clearly took pains to release this article near practically the MINUTE the date rolled over to April 1, to go by the other comment here? J'accuse, sir, j'accuse indeed! Now now! KoopaTV has bad timing in general. We release things at, say, 11:59 PM all the time. One of these days we're bound to miss the mark! I still believe it will happen.